Prosecutors later said the man had died. They are treating the incident as a terrorist attack. In March 2016, 32 people were killed in attacks on Brussels claimed by the Islamic State (IS) group. 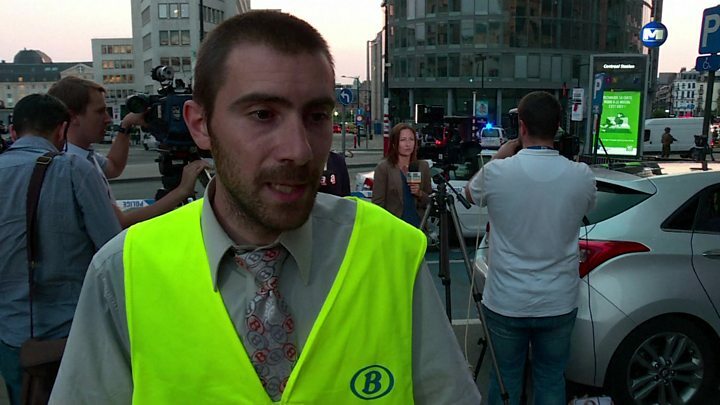 According to Belgian newspaper La Libre Belgique, quoting prosecutors, the man who was shot was wearing a rucksack and a bomb belt. He detonated a device when he attracted the attention of soldiers in the station, the paper says. "Then he cried 'Allahu Akbar' and he blew up a wheeled suitcase," he told AFP news agency. Mr Van Herrewegen described the suspect as well-built and tanned with short hair, wearing a white shirt and jeans. "I saw that he had something on him because I could see wires emerging, so it may have been a suicide vest," he said. Lawyer Remy Bonnaffe, 23, was waiting for a train and took a photograph of flames seconds after the explosion. He told Reuters news agency that people close to the explosion appeared unhurt and he saw no obvious damage to nearby walls. "I'm happy that no-one was injured and that this was basically a failed attempt," he said. Arash Aazami arrived at the station just after the explosion. He told the BBC: "As we entered into the station, we were evacuated loudly by some security personnel. "Looked around, saw people running in the streets, trying to seek refuge and decided to do the same ourselves." 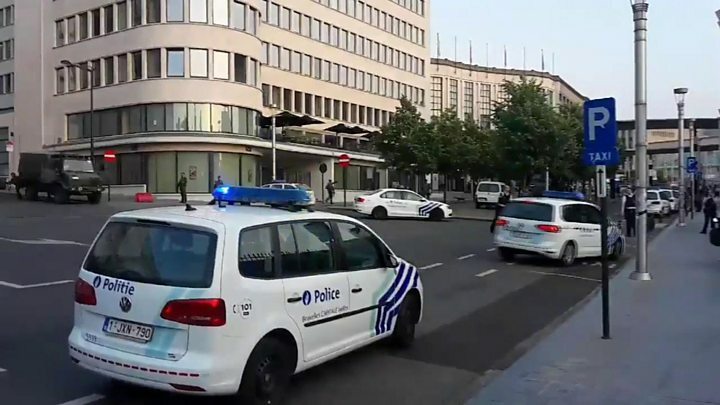 As the station and Grand Place were evacuated, businesses and restaurants were ordered to close and draw down their shutters, RTL radio reports. Metro lines running through the station were also briefly suspended on orders of the police, according to the radio. On 22 March of last year, three suicide bombers mounted twin attacks on the city's Zaventem airport and Maelbeek underground station. The same Brussels-based IS cell was also behind the gun and bomb attacks in Paris in November 2015, that killed 130 people. The French capital was jolted again on Monday when a man with an Islamist background died after ramming his car into a police van on the Avenue des Champs-Élysée.